The Wurtâ are the demi-goddesses of destiny. They control the destinies of both gods and men, as well as the unchanging laws of the cosmos. They are represented as three sisters: Urda ("past"), Werdanda ("is becoming") and Sculd ("owed"). They live at the base of the World Tree Yggdrasil in the realm of Enbsigart. 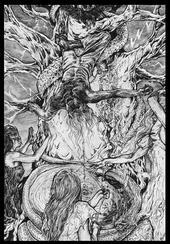 Nothing lasts forever, and even the mighty Yggdrasil is subject to decay. The Wurtâ try to stop this process, or at least slow it down, by pouring mud and water from the Well of Fate over its branches. This magical liquid stops the rotting process for the time being. In other myths, the Wurtâ were thought to give assistance at birth, and that each person has his own personal Wurt. I’m going to go out on a limb here (so what else is new). When we try to put the Nine Worlds in specific areas or regions it becomes problematic. In dealing with the metaphysical, I believe that directional appointment is futile. When we try to put things in certain places we are placing them there according to our physical perspectives. Once one gets into realms beyond our knowing positioning becomes pointless. I can compare it to what it might be like when one is buried in an avalanche. It has been said that if one becomes buried in an avalanche one should never start trying to dig one’s self out because it’s impossible to determine which way is out. It’s the same dealing with the metaphysical: there is no up, down, inside or out. It just is. I see the Nine Worlds of the Germanic Cosmos with five Worlds completing the trunk of the Tree with four worlds making up the branches. Argue with me if you want but this is the way I see it. 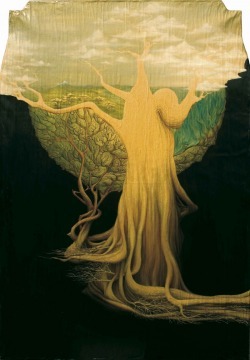 How brilliant of our ancestors to realize that there are other realms of existence! It’s an easy transition to see Irminsul as a metaphor for the human body with the Nine Worlds as that which comprise our being with pathways that inter-connect. 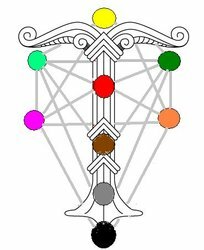 I postulate that it's possible to metaphysicaly place ourselves on the Irminsul; to draw Runes, placing them on each given sphere on the human body to gain insight on how we handle our ideals, drives, passion, challenges, etc, for self-realization. Further, this would be possible to do for others; however, it would take quite a Runester who is totally comfortable with doing so. I fully believe a novice (or a non-Heathen, for that matter) should never try this.